My neighbors just had a baby on Monday, and my gift to new parents is often a home cooked meal delivered within the first few days of new parenthood. 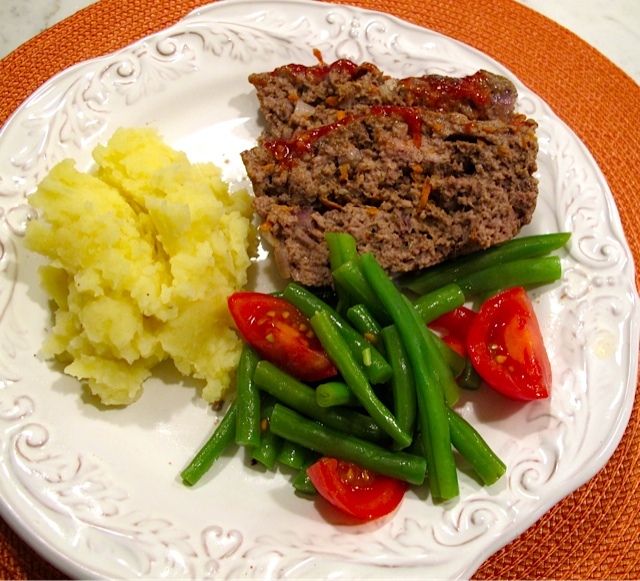 I was thinking about this last night because I made my famous meatloaf, onion mashed potatoes and green beans coated with olive oil and tomato slices. It is nothing exotic or particularly gourmet – just good, old-fashioned comfort food! I’ve been preparing meatloaf of at least 30 years and don’t even know where I found the initial recipe. My global adventures made me curious about the origin of this kitchen staple so I did a little investigating. Meatloaf, or some derivation thereof, has apparently been around since the 5th century. It is traditionally a German, Belgian or Dutch dish and my Italian friends adopted it to make meatballs. In America, German-Americans made it with scrapple – which was a mixture of ground pork and cornmeal. This doesn’t sound too appealing to me – but it was likely quite a treat back in the day. Meatloaf as we know it today didn’t appear in American cookbooks until the late 19th century and I can only imagine the hundreds of variations that have since been developed. A beautiful thing about this recipe is that it makes a large loaf and leftovers can be used in endless ways. I like to have meatloaf sandwiches with fancy mustard, greens, tomato, or slice and grill it and serve it as a “slider” or repurpose it open-faced with mashed potatoes and gravy for a slightly different twist. I usually double the recipe, even when I make it for the two of us and I leave one that hasn’t been baked in my freezer for times when I have no time or energy to cook. Dump all these ingredients into a large bowl. Put on disposable gloves and gently mix the components together until they are combined. Remove from the bowl (don’t wash the bowl yet) and pat gently into a greased loaf pan. I bake it in my 40 year old 9 x 5 Pyrex meat loaf pan. Slide the meatloaf into the preheated oven for 15 minutes, and while it is baking make the topping in the same dirty bowl. Mix the topping ingredients together well. After the meat loaf has baked for 15 minutes without the glaze, remove it from the oven. Gently cover the top with the ketchup-based sauce and bake another 45 minutes or until interior temp hits 160 degrees. Rest for at least 10 minutes, the cut it into slices and serve. 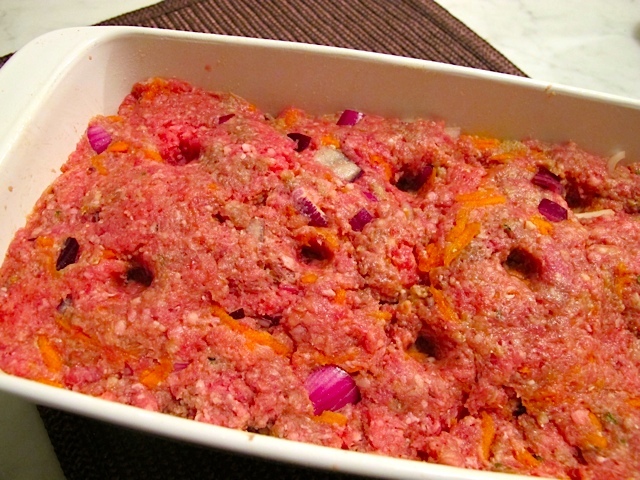 Note: There is a lot of juice and fat that accumulates around the meatloaf when you bake it in a pan. Generally I pour all of this into a Pyrex measuring cup and remove the fat only, and then return the juice to the meatloaf pan. OR you can eat the meat loaf as is and refrigerate the leftovers. The next morning you will see an orange layer of fat that is easy to lift off with a spoon. Some of my friends add ½ cup of Parmesan cheese to the meat mixture.